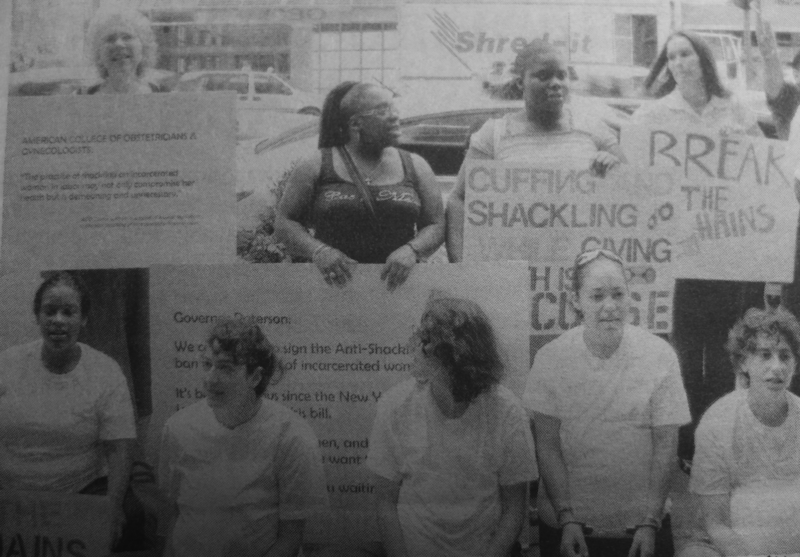 During the summer of 2009, activists gathered in Manhattan outside of then-governor David Paterson’s office to demand an end to the practice of shackling incarcerated women during childbirth. In May 2009, both houses of the New York State Legislature passed a bill that would bar the shackling of women during labor. At the time of the rally, the bill was being reviewed by the governor’s office. The demonstration was sponsored by Women on the Rise Telling HerStory (WORTH), the Correctional Association of New York’s Women in Prison Project, and the New York Civil Liberties Union. In this photograph, we see protesters with signs outlining the protesters’ demands. One sign reads, “BREAK THE CHAINS.” A number of protesters at the action wore handcuffs and oversized white T-shirts (with pillows beneath their shirts) to display the humiliation that incarcerated pregnant women experience when shackled. In a recent interview, WORTH co-founder Tina Reynolds recalls this rally, and explains that the organizers had asked allies who had not directly experienced shackling to wear the handcuffs, T-shirts, and pillows. The organizers of this rally wanted to make sure that women who had been shackled during childbirth would not have to re-experience the trauma of shackling.